Tampa, Fla. — Tyler Johnson returned to action for the Lightning on Wednesday night as the Bolts notched their first loss of the season, falling 4-1 to the Vancouver Canucks. The Lightning dominated the first period but missed opportunities set the tone for the night. Tampa outshot the Canucks 17 to five in the first and played four minutes with a man advantage. 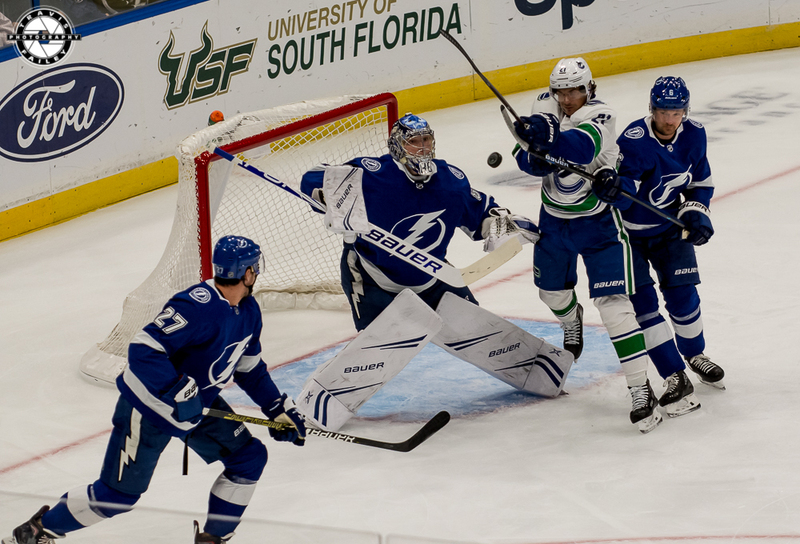 A couple of open one timers from the Bolts’ rookie Mathieu Joseph and captain Steven Stamkos were sent wide, and Brayden Point was stonewalled on a beautiful wrist shot from just outside the crease early. 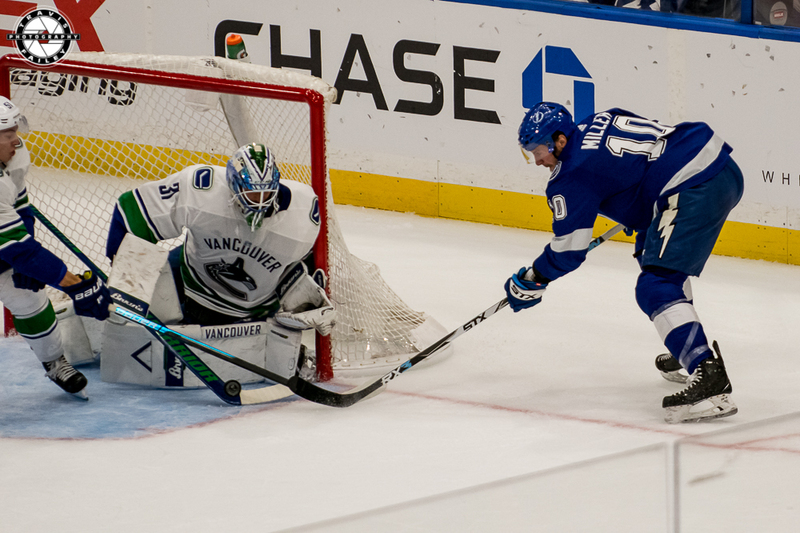 The Bolts’offensive pressure couldn’t be contained for long, despite Vancouver goaltender Anders Nilsson’s best efforts, as Point made up for his missed opportunity by burying the game’s opening goal with just over three minutes left in the first period. 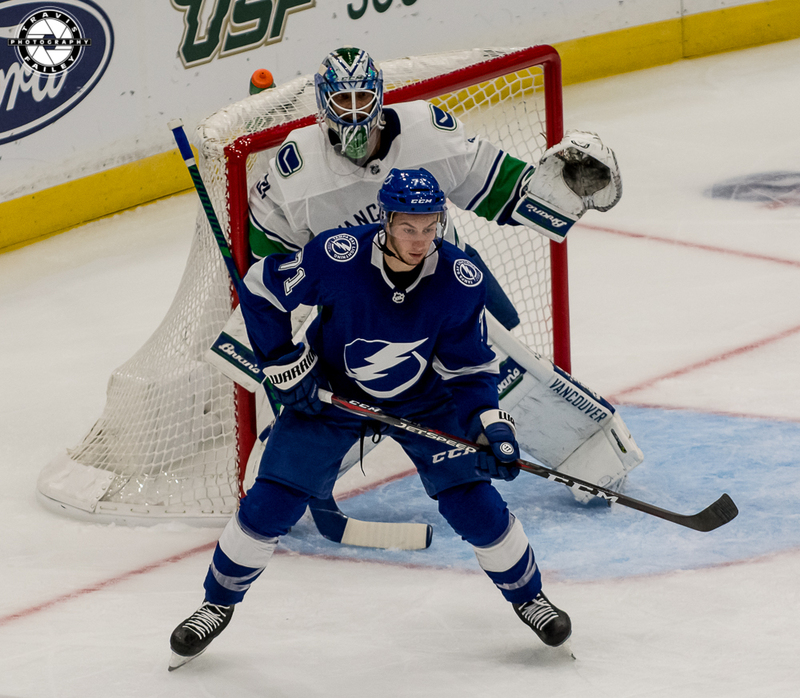 Point’s goal was his first of the season and came on assists from Yanni Gourde and Braydon Coburn. 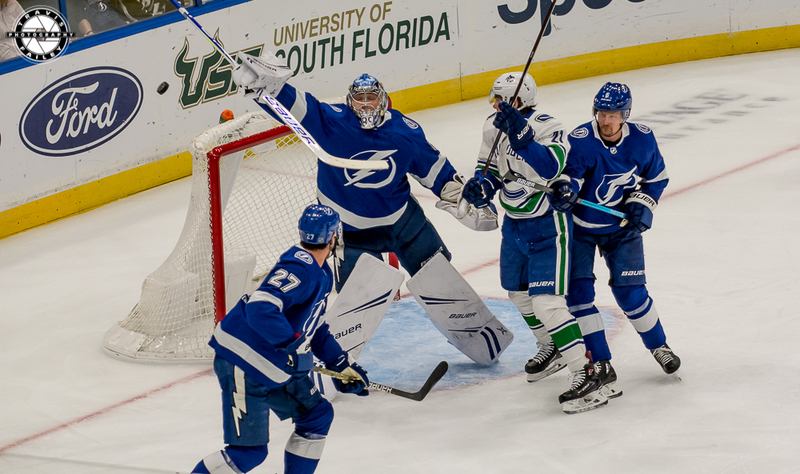 The Lightning continued their walk past the Canucks into the second, but this time it came in different fashion. The Bolts put just eight shots on goal compared to the Canucks’ even 10 in the period but Tampa controlled the pace of play with the exception of a brief penalty kill early and a three minute series in which the Bolts’ gave the Canucks 37 seconds with a two-man advantage between penalties to Ryan McDonagh and Anthony Cirelli. 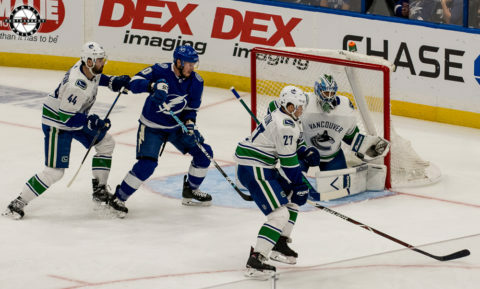 Despite the Canucks sending men to the penalty box on three separate minors in the second, Tampa again failed to convert and the second period ended with the Lightning still leading 1-0. The Bolts would actually fail to convert on any of their five power play opportunities in the game. Tampa was a shell of their former selves in the third. At no point in the game had the Bolts looked great but at least they looked better than Vancouver. The Canucks held Tampa without a shot for more than three minutes to start the period and forced the Bolts to play on their heels, not allowing them to control the puck. With 9:53 remaining in regulation Vancouver broke through when Elias Petterson deflected a rocket from Derrick Pouliot past Andrei Vasilevskiy for the game-tying goal. 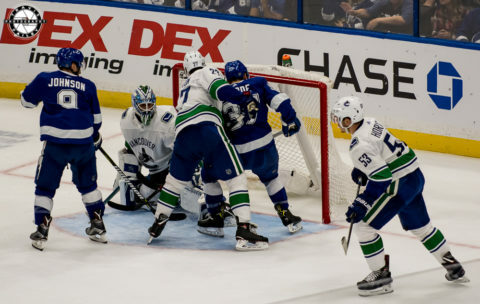 Just 70 seconds later, on the Canucks next shot, Brock Boeser lit the lamp again for Vancouver and in a snap they had taken the lead. Two empty net goals from Jake Virtanen and Markus Granlund in the final 75 seconds sealed a win for Vancouver and capped a phenomenal night from their goaltender, Anders Nilsson, who saved 33 of the 34 shots Tampa put on net. “We came out with a lot of energy, came out skating, which was something we focused on,” Stamkos said. “But it’s a complete game. It’s not how you start, it’s how you finish and they finished better than we did.